A roses wedding theme can be absolutely romantic. But you can really incorporate roses into virtually any wedding theme, or you can make them stand alone as your primary theme. 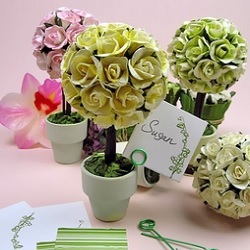 They come in a variety of beautiful colors, and you always have the option of dipping them to create unusual rose bouquets for members of your wedding party. From piles of rose petals to individual roses and bouquets of all sizes, there are endless ways to decorate with roses for the big day, but you will need at least a couple favor ideas to show appreciation to your guests. 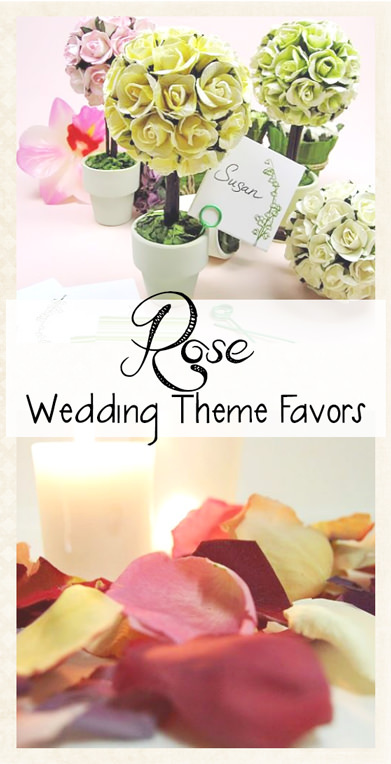 The best rose wedding favors give your guests something to take home in memory of your wedding while also contributing to the decorative appeal of your reception venue. Think about the blooming nature of roses as well as vibrant colors, the silkiness of the petals and the thorns that you have to watch out for. There are some great pre-made favors out there, and this list will introduce you to some of your favorites. 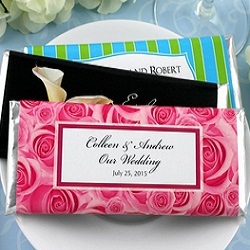 Personalized Hershey’s Chocolate Bars - Select the rose-themed label and customize it to reflect the details of this day that you never want to forget. These individually-wrapped bars give all of your guests a taste of sweet chocolate during or after your reception. The chocolate is authentic Hershey’s, so your guests will know you went the extra mile to give out favors they will enjoy. If you want to use your chocolate as filling for favor boxes or baskets, consider mini Hershey’s chocolate bars with personalized labels. 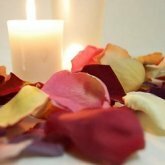 Rose Towel Favors - Everyone can use an extra hand towel around the house, so why not turn that practical item into a functional gift for your guests? These fun roses are crafted from red or yellow hand towels, so your guests can unravel them at home and put them to good use. The towels are 100% microfiber and are crafted into rose shapes with attached stems, leaves and tags. These are perfect to set at each place setting for your reception because they contribute to your decorative design while grabbing the attention of guests. 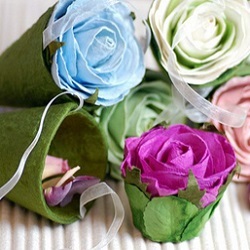 Floral Hanging Favor Cones - These fun green cones are topped with full roses in your choice of color. 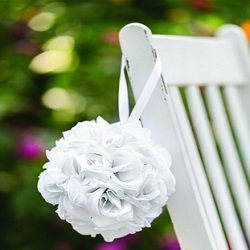 You can fill them with small treats and hang them on the backs of each chair at the wedding or reception hall. 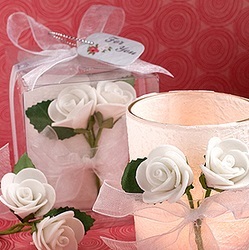 Not only will they help you decorate for your rose wedding, but they will give your guests something sweet to take home. Long-Stem Crystal Roses (www.favorwarehouse.com) - Give all of your guests a rose to show how beautiful they are inside and out. 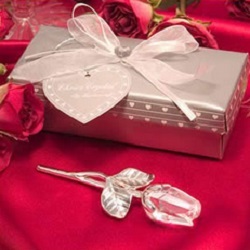 These unique favors feature gorgeous clear crystal buds with a stem made from chrome. 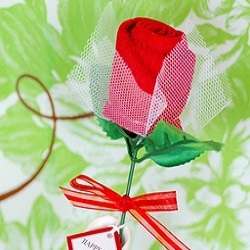 Add the embossed leaves and you see why this is one of the most elegant rose wedding favors out there today. Each rose comes in an individual silver box, so you can easily hand these out to special guests who deserve a hug of gratitude and love. They also look amazing bunched together in baskets for all of your guests to enjoy. You can also find crystal rose favors in red and purple.